Want to improve your composition? Attach a wide-angle lens to your camera, something around 24mm, and go around for a few hours and photograph using only this lens. If it is a zoom lens, don’t change the focal length. For those with cropped frame cameras, you can set your focal length to around 16mm. Wide angle lenses can capture so much in the frame that it really forces you to move around in order to simplify the scene and eliminate all those extraneous details. These lenses also have more depth of field so it is more difficult to blur out backgrounds behind your subject compared with what telephotos can do, so selecting foreground and background objects becomes even more important. You won’t have the flexibility of a zoom lens, so you’ll probably find yourself having to work very closely to your subjects or looking for simpler scenes than you would expect to. When you download the photos to your computer, look at every frame closely. You may be surprised that in some photos there are many distracting things around, especially in the background, which you did not notice at the time you were taking the picture. Do this exercise a few times, and your composition skills should increase a few levels. 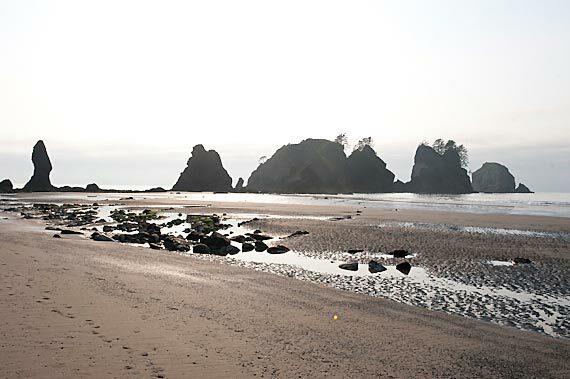 The two photos below were photographed at Shi Shi Beach in the pristine wilderness of the Olympic Peninsula in Washington State, USA. Both were taken with wide-angle lenses. The first one was a snapshot in harsh midday light from normal standing height. The second one was shot at dusk. I worked the scene to simplify it and provide a nice foreground to background balance, and took it from a low angle to give the foreground more prominence. If you look closely at the first photo, you can see roughly where I needed to be for taking the second shot. I’m pleased to announce that our photography trips have been well received by American Express and that they have joined us as a partner. Our two remaining ‘Mountain Kingdoms of Yunnan’ trips in Northwest Yunnan for 2011 will serve AMEX Centurion card members. We will, of course, continue to run many trips for non AMEX members. We’ll be finalizing our 2012 trip schedule in July. We are planning for at least one trip next year from Lhasa to Mt. Everest Base Camp. This stunning itinerary to the roof of the world offers views of the 8,000 metre peaks of Lhotse, Makalu, Cho Oyu, and Everest itself, along the way. We will also explore amazing monasteries and holy lakes that in themselves offer fantastic photo opportunities. What’s the surest way to fail at getting a great photograph? To not go out at all. I cannot count the number of times that I’ve been glad that I’ve bothered to get up early, or delay the dinner, or braved the rain for the chance that the elements would come together. In the summer of 2007, I flew into Lhasa for a photo project. I was out immediately exploring around The Jokhang, Tibet’s most sacred Buddhist temple, despite not having been acclimatized. As the late afternoon rains came in, most scrambled for shelter. However, I could see in the west that the cloud cover did not reach down to the horizon. If the rain remained long enough until the sun dipped below the clouds, I knew a rainbow would appear. So rather than join others in comfort, I paid the 70RMB entrance fee to the temple, and climbed a set of stairs up to the roof. 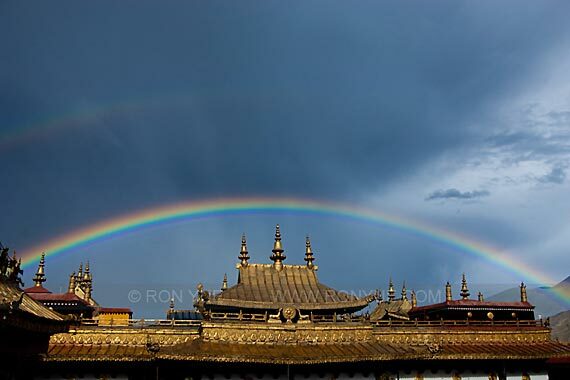 It didn’t take long before I was able to capture a fantastic rainbow almost perfectly centred over the roof of The Jokhang. Did that take incredible skill? Not really. I think many people with a reasonable sense of composition could have captured a similar image. Next time you are considering staying in, or going in, think again. Perhaps that great photograph that you captured by staying out will remain with you for your life, while you’ve probably already forgotten that you were hungry just a bit longer while being out there. During that period, the only others up on the roof with me were a French fellow, and a couple of monks, one of whom had a nice Nikon camera. Now I know what some of those entrance fees go towards! Whenever someone asks me, my answer is usually one and the same – Your own eye. 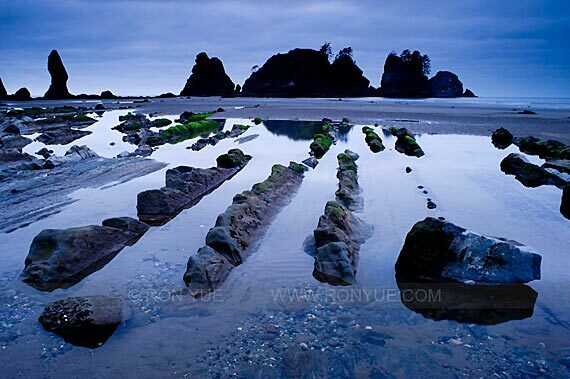 No camera or lens can ever replace your ability to make a great composition, or do all the creative thinking for you. I smile whenever someone says, “This camera takes great pictures”. My response, “No, you took a great picture, and that is a nice camera by the way.” A camera is not going to compose a great photo for you anymore than a scalpel is going to perform a great operation for a surgeon. Sure, if you like to shoot F1 races, that expensive top end DSLR with a giant fast focusing super telephoto lens will probably get you sharper photos than entry level equipment. My Nikon D3 with a heavy f2.8 zoom with image stabilization will give me more flexibility if shooting handheld in very low light situations. However, in most situations, that lightweight basic DSLR set up will do just as good a job, and probably better at times as you’ll be more inclined to actually carry It rather than exhaust yourself lugging a bag of heavy gear around all day. I’ve shot a cover photo using a plastic mount 100USD lens. Many people tend to worry more about their camera gear instead of maximizing their photography skills. You’ll be surprised what can be done with a simple set up. Remember, cameras don’t take photographs, people do. 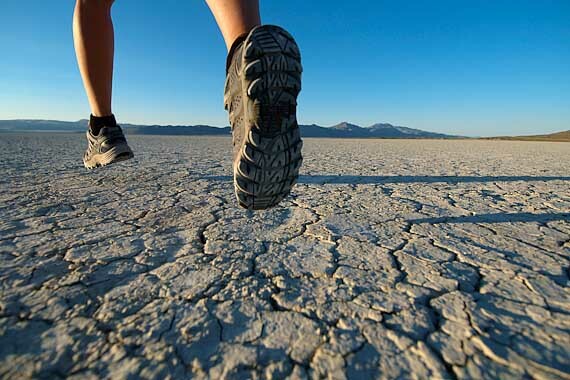 This photograph was taken at the Black Rock Desert in Nevada, USA on a 6MP Nikon D70 camera. The full size file was upsized and was good enough for a stock agency that accepts minimum 48MB uncompressed file sizes. Years ago when I first visited a rebuilt, tourist-crowded section of The Great Wall on the outskirts of Beijing, the whole experience left me cold. This was not the romance I had imagined for ages, jostling with boisterous tour groups that had spilled off the buses and being constantly pestered by hordes of over zealous souvenir vendors. I was crushed to the point that I felt like turning around immediately. But I was stuck with a small group and we had limited time so I grudgingly decided to make the most of a disappointing situation. I pushed past the hawkers, climbed a long set of stairs and desperately sprinted through the crushing throng to one end of the restored section of wall, where the mass of humanity thinned out, and peered around the last watchtower and past a barrier with a “Danger – no admittance” sign attached to it. I could see the wall continuing here, alone, in a semi-crumbled state, twisting and winding away from me and then disappearing over a rise. Far away, up high, it appeared again, clinging to a mountain ridge. Years of history were whispering to me, beckoning me, and daring me to take a few steps into her time to see what lay out of sight. First built over 2,000 years ago and then extended, rebuilt, or repaired in subsequent dynasties, the wall in this condition was fulfilling my idealistic imagination of mystery and intrigue – weathered and partially reclaimed by the land, but not so much that its decorated past was lost. I spent what little time I had sitting in one of the windows of that tower staring out onto this remarkable panorama before being rudely jolted from my reverie by our guide exclaiming that our transportation would be leaving soon. I knew I’d return. Exploring those wild, precarious, and lonely sections of the wall many miles beyond the crowds defines travel and photography for me – when adventure, adrenaline, and history converge. 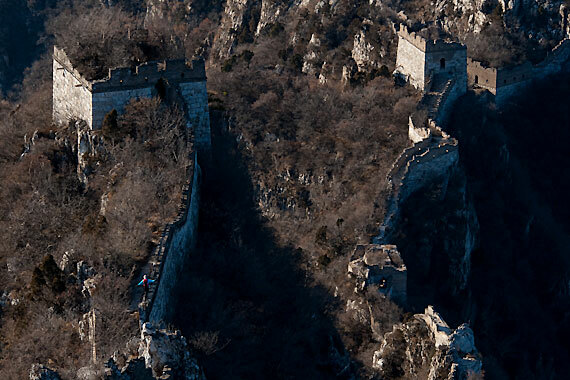 That’s my fiancee (bottom left) approaching a stunning section of the wall up in the mountains. Hi! Thanks for visiting my website and blog. I will be posting featured and new photographs, photography tips and techniques, discussions on equipment, stories and inspiration from life in the field, and other fun bits and pieces. Please come back and visit regularly.